The 2D Materials and Devices group (2DMD) research focus on CVD growth, transfer and device fabrication, using 2D materials, clean-room technology, and Raman imaging for structural characterization. Particular attention is given to biosensing devices, where immuno-assays and DNA sensors based on graphene liquid-gate FETs were developed. The devices specificity for particular biomarkers is achieved by functionalization of the graphene channel. DNA detection based on electrochemical arrays of graphene microsensors is achieved. The group is running collaborative projects on the fabrication of optoelectronic devices: a photodetector based on Van der Waals stacking of 2D materials (with LANASC and UMinho), and photocathodes that can potentially realize un-assisted solar water splitting by coupling tandem amorphous silicon solar cells with high efficiency hydrogen evolution electrodes (with NESC and IPV-5 Jülich). The 2DMD group research interests include the study of single photon emitters from controlled defects in h-BN (with Nanophotonics dept.) and the fabrication of graphene plasmonic devices that operate in the sub-mm wavelength range. 028114: Total Budget: €239.924,23. Duration: 01 July 2018 – 30 June 2021. This project’s main idea is to develop a new spectroscopic technique based on tunable plasmonics in graphene, by exploring the polarization dependent interaction of small biomolecules with terahertz (THz) radiation. Graphene is widely recognized as an ideal platform for strong light matter interactions due to its excellent plasmonic response in the mid-to-far infrared spectral range. In addition, the plasmonic response of graphene is highly tunable in real time using electrostatic gating. Fundamental structural features of peptides that are critically important for their functions can, in principle, be probed by polarization dependent spectroscopy in the THz range, as described in a recent simulation study, which also explicitly noted that THz chiroptical spectroscopy has not yet been demonstrated experimentally. The innovative aspect of this project is, therefore, to develop devices that realize this predicted technique for molecular analysis using spectroscopic plasmonics. Two different architectures will be developed for implementing strong light-matter interaction between graphene and biomolecules. In one approach, micrometer wide ribbons of graphene, patterned by optical lithography, act as the active plasmonic medium. The second approach consists of transferring a continuous graphene sheet onto a grating of high dielectric contrast provided by alternating lines of SiO2 and Al2O3 on a high resistivity silicon wafer. Both architectures are based on theoretical simulations developed and performed by the team members, who have recently published their studies in a book about graphene plasmonics. Specifically, the two device architectures are modeled using full electrodynamics calculations, which are faster and perform better than the conventional time domain integration of Maxwell’s equations. The high sensitivity of surface-based detection methods, including conventional noble metal plasmonics, makes them particularly advantageous for analyzing small quantities of biomolecules. 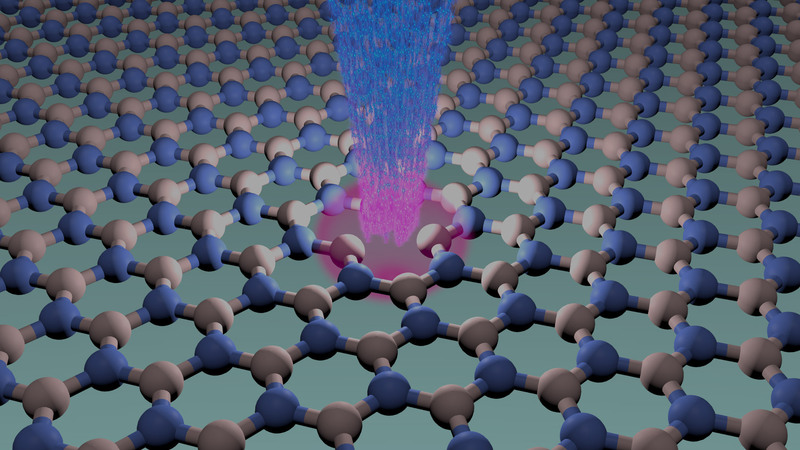 Being a 2D material, graphene is a natural choice for implementing surface-based sensors. Furthermore, the unique properties of the electromagnetic coupling of molecular excitations to surface plasmons in graphene open possibilities for extending the analytical capabilities of these sensors beyond the current state of the art for label-free measurements. Real-time tuning of plasmon resonances in graphene will enable spectroscopic, i.e., more specific, detection of biomolecules in presence of solvent and other background signals. This specificity will be enhanced by structural, e.g., chiral, signatures enabled by polarization dependent THz measurements. The specificity and information content of these measurements will be further enhanced by taking advantage of the high-intensity tunable broadband THz excitation produced by the two color air plasma method and of the time-resolved pump probe capabilities of the THz source and spectrometer to be developed in this project. Main Goal: The idea of this project is to explore plasmons in graphene for a new spectroscopic technique. This technique covers the THz and the mid-IR. Graphene plasmons exist in these spectral ranges in which noble-metal plasmons are not available. The excitation of surface plasmons in graphene produces huge resonances in the extinction spectrum of the material. These resonances amplify tremendously the absorption signal due to molecules deposited on graphene and therefore can be used as a tool for the spectral identification of small quantities of analytes, down to a monolayer. The absorption of the analytes is due to their rotational and vibrational modes. The signal due to the absorption of the analytes is superimposed on the plasmonic resonance and appears as dips in the resonance signal. Depending on the rotational or vibrational excited energy levels, the dips are located at different positions, thus allowing an amplified spectroscopic signal. POCI-01-0145-FEDER-031069: Total Budget: €239.760,83. Duration: 15 June 2018 – 14 June 2021. Portugal, and in particular the north region, is a leading producer of wine in the EU, with one of the highest numbers of DOP and IGPs in Europe, including world-known Port and Douro wines. Among common wine adulteration, the use of different grape varieties from the ones authorized by the PDO, or the use of more than one variety in wines labelled as monovarietal, are one of the issues of higher concern for producers and authorities. DNA based analysis have become a very useful instrument on food and environmental analysis. DNA analysis is of high interest as well for varietal discrimination of grapes, wines, musts, and grape juice, due to the high specificity allowed by the use of DNA sequences, and the possibility of amplifying such DNA markers by PCR and other amplification strategies, and therefore obtaining higher sensitivity. Despite its advantages for grape variety identification, DNA analysis has not been extensively used by control laboratories, due to some drawbacks for their practical implementation. Several developments in the last years are being directed towards the improvement of DNA based analysis in order to simplify, miniaturize and reduce both the time and price of analysis with increased performance, to develop devices and methodology to be effectively used by control laboratories. Among such improvements, several sensors have been developed with promising characteristics, among them, field-effect transistors (FETs) allow to achieve high sensitivity, specificity and rapid measurement without the need of labelling, making them excellent candidates for wine/grape authenticity analysis. Likewise, there has been a strong interest in developing portable point-of-care devices that can be used in resource-limited settings, such as remote regions, farms or cultivars. Several approaches towards micro total analysis system (μTAS, or lab-on-a-chip) have been developed, which provides a significant improvement in performance. However, to our knowledge and despite of their clear advantages, no commercial μTAS are currently available and validated for DNA analysis in wine or food commodities. Main Goal: The main objective of the project is the development, test and in-house validation of a miniaturized DNA sensing device for varietal discrimination of grapes, wines, musts, and grape juice in order to ensure the authenticity of wine from Port and Douro DOP. With this objective the participating teams will combine their expertise for the development of a miniaturized analytical device composed of 3 modules namely: a DNA extraction and purification module, an isothermal DNA amplification module, and a DNA Biosensors based on field-effect transistors (FETs) made using single layer graphene (SLG) for varietal discrimination. The integrated device will be in-house validated with different complex matrixes including grapes, wines, musts, and grape juice. 029417: Total Budget: €239.886,50. Duration: 01 June 2018 – 31 May 2021. The modifications of the fluorescence lifetime by the presence of fluorescence quenchers can be used to increase the axial resolution of fluorescence lifetime imaging microscopy (FLIM). The axial spatial range of the quencher material depends on its refractive index (RI), so materials with different RI can be explored in order to improve and modify the imaging axial range and axial resolution of FLIM. The main goal of the project is to optimize the FLIM technique for different resolutions and distance ranges to study different biological processes. Applications range from DNA detection to the time lapse super resolution imaging of live cells to track specific molecular biological processes in real time. Main Goal: Optimization of a Fluorescence Lifetime Microscopy Imaging (FLIM) technique for axial super-resolution using various functional substrates and its application for biosensing and bioimaging. POCI-01-0247-FEDER-033566: Total Budget: €1.633.967,09. Duration: 01 August 2018 – 27 January 2020. The market awareness to graphene and related materials has been growing steeply, as a result of promising results obtained in an experimental context. However, the application of these materials at an industrial scale has not yet been attained yet due to a number of constraints of the available production technologies, which can be generally resumed as an inability to simultaneously produce graphene in quantity, quality, and price, according to the needs of the industrial sector. Acknowledging this gap between the existing technologies and the industry needs, Graphenest has designed and developed an innovative technology, supported by a graphite exfoliation method in liquid phase using ultrasonic cavitation. Duly tested/validated at a laboratory scale, through the development of a prototype, Graphenest’s technology now needs further demonstration at a pre-industrial scale (and full industrial, at a later stage). The GNESIS project emerges in this context, aiming at (i) assuring the scale-up of Graphenest’s technology into a pre-industrial scale and (ii) demonstrating the application of the graphene-based materials obtained from the referred technology in three different application areas, namely: anti-corrosion paints; polymers with electromagnetic shielding; and tactile screen electrodes. 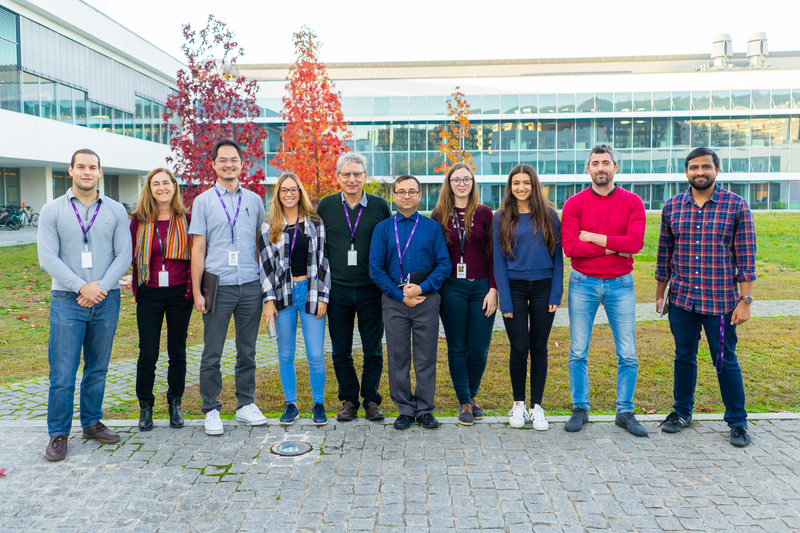 The GNESIS project will be promoted by a full consortium consisting of two companies with strong R&D skills – i.e., Graphenest (project leader) and Displax – as well as three entities from the Portuguese Research and Innovation System – i.e., the International Laboratory of Iberian Nanotechnology, University of Aveiro and University of Minho. In addition, the project will be attended by three national associated business partners – i.e., Bosch, CIN and Galp Energia – and an international one – the Chinese company Zhejiang Light-Tough Composite Materials. “Immuno-field-effect transistor platforms based on 2D materials for early detection of biomarkers of ischemic stroke”, PhD project of Patrícia Daniela Cabral da Silva. This thesis proposes to use clean-room micro and nanotechnology to fabricate label-free immuno-assays, based on graphene and other 2D material (hBN, MoS2) field-effect transistors, whose channel is functionalized for a set of biomarkers related with the hemorrhagic transformation in ischemic stroke. The project is based on the development, fabrication and testing of a multiplex microfluidic platform, which will be able to signal a panel of biomarkers at an early stage of the disease, thus contributing to spare the lives of many patients. NORTE-01-0145-FEDER-000023: Total Budget: €3.284.706,21. Duration: 01 April 2016 – 31 March 2019 (36 months). The main of objective of FROnTHERA is to boost the progress of Tissue Engineering and Regenerative Medicine fields with main focus on cancer, diabetes and neurodegenerative diseases. To accomplish this, the merge of 3D tissue engineered in vitro models of diseases, microfluidics, nanotechnologies, molecular biology and embedded biosensors will be pursued in order to obtain new tools and technologies to be used as alternative to animal experimentation, as well as, personalized therapies for Human health. Ultimately, the strengthening of these interdisciplinary domains will allow the improvement of theranostics of RIS3 diseases. 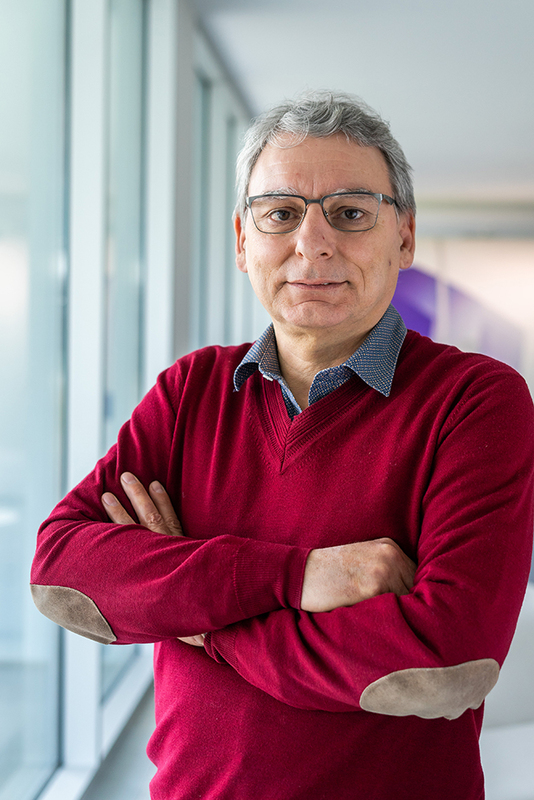 This project is an initiative of three top leading research units, located in the PT 11 region, and gathers experts in tissue engineering in vitro models, neurosciences and emergent technologies based on responsive biosensors, whose main goal is to dvance in research for developing tools and technologies to be used as alternative to animal experimentation and in personalised therapies for human health. NORTE-01-0145-FEDER-000019: Total Budget: €2.547.789,00. Duration: 01 April 2016 – 31 March 2018 (24 months). The major goals set for the integrated project cover an increase of our human resources in strategic areas by hiring 15 new researchers for the 2 research lines, a strengthening of our core activities in various project areas (sensing, system integration etc.) as well as the opening of new scientific topics (thermal energy harvesting, label free optical/graphene biosensors, etc. ), and re-enforcing partnerships and collaborations with major national/regional industrial actors (electronics, health, food and environment, materials ). The program will provide nanotechnology-based solutions for 2 areas: autonomous sensing systems (targeting Internet-of-Things integration) and monitoring and treatment platforms for applications related to water, food, and health. Each challenge is the focus of a research line, while the program integrates both lines at several levels via shared and reciprocal goals, new technology platforms and (nano)materials, and characterization methods. PTDC/FIS-NAN/3668/2014: Total Budget: 146.508,00 €. Duration: 36 months. This proposal aims to develop silicon based photocathodes coated with a chemically-inert thin protection layer and coupled with inexpensive, earth-abundant transition metal phosphide (TMP) nano-catalysts. The project focuses in developing photocathodes with a high open circuit potential that can potentially realize un-assisted solar water splitting, using tandem hydrogenated amorphous Si thin film solar cells coupled with TMP nano-catalysts as photocathodes. Apllied Surface Science, 480 , pp. 709-716, 2019. ACS Sensors, 4 (2), pp. 286-293, 2019. Journal of Physical Chemistry C, 122 (48), pp. 27127–27134, 2018. Bottom-up fabrication of thermoelectric (TE) materials from colloidal nanocrystal (NC) building blocks can substantially increase their TE efficiency, for example, by reducing lattice thermal conductivity. In this work, 10 nm spherical phase-pure oleate-capped PbTe NCs with narrow size distribution were synthesized and employed to fabricate 50 nm thick films on insulating SiO2/Si substrates. The spin-coating, with subsequent ligand exchange procedure, was applied to enhance coupling interactions between the NCs. Using dark conductivity measurements, we confirmed the semiconducting behavior and the Schottky-type electrical field-dependent conductivity mechanism in the resultant thin films. The thermal transport in the thin film was probed by means of a time-domain thermoreflectance method. For this purpose, we used a customized state-of-the-art system based on a picosecond thermoreflectance instrument, which enables area-selective analysis with spatial resolution down to 5 μm. The results show that the as-fabricated PbTe NC films exhibit ultralow thermal conductivity of 0.9 W m–1 K–1 at 300 K. The transport property findings suggest potential in the proposed quick and cost-effective spin-coating strategy for bottom-up fabrication of nanostructured TE films from high-quality colloidal NC building blocks. Nano Research, 11 (9), pp. 4823–4835, 2018, ISSN: 1998-0124. Vertically aligned p-silicon nanowire (SiNW) arrays have been extensively investigated in recent years as promising photocathodes for solar-driven hydrogen evolution. However, the fabrication of SiNW photocathodes with both high photoelectrocatalytic activity and long-term operational stability using a simple and affordable approach is a challenging task. Herein, we report conformal and continuous deposition of a di-cobalt phosphide (Co2P) layer on lithography-patterned highly ordered SiNW arrays via a cost-effective drop-casting method followed by a low-temperature phosphorization treatment. The as-deposited Co2P layer consists of crystalline nanoparticles and has an intimate contact with SiNWs, forming a well-defined SiNW@Co2P core/shell nanostructure. The conformal and continuous Co2P layer functions as a highly efficient catalyst capable of substantially improving the photoelectrocatalytic activity for the hydrogen evolution reaction (HER) and effectively passivates the SiNWs to protect them from photo-oxidation, thus prolonging the lifetime of the electrode. As aconsequence, the SiNW@Co2P photocathode with an optimized Co2P layer thickness exhibits a high photocurrent density of–21.9 mA·cm−2 at 0 V versus reversible hydrogen electrode and excellent operational stability up to 20 h for solar-driven hydrogen evolution, outperforming many nanostructured silicon photocathodes reported in the literature. The combination of passivation and catalytic functions in a single continuous layer represents a promising strategy for designing high-performance semiconductor photoelectrodes for use insolar-driven water splitting, which may simplify fabrication procedures andpotentially reduce production costs. Sustainable Energy & Fuels, 2 (5), pp. 978-982, 2018. Vertically-aligned, highly-ordered silicon nanowire (SiNW) array photocathodes are fabricated employing e-beam lithography followed by deep reactive ion etching (DRIE) of Si. The effect of structural parameters of SiNWs, including wire diameter, length and inter-wire spacing, on their photoelectrocatalytic hydrogen evolution performance has been systematically investigated. Within the range of dimensions under study, the SiNW photocathode with a wire diameter of 200 nm, a length of 1 μm and an inter-wire spacing of 175 nm shows the best performance exhibiting a maximal saturated photocurrent density of 52 mA cm−2 and an onset potential (@−1 mA cm−2) of −0.17 V versus reversible hydrogen electrode. These lithography-patterned SiNWs with homogeneous structural parameters can help establish an unobscured structure–activity relation and facilitate Si-based photoelectrode design. Carbon, 129 , pp. 63-75, 2018. Microelectronic Engineering, 189 , pp. 85-90, 2018. Surface and Coatings Technology , 328 , pp. 134-141, 2017. Nanoscale, 9 , pp. 2711-2717, 2017. RSC Advances, 53 , pp. 47730-47740, 2016. Journal of Physics: Condensed Matter, 28 , pp. 085302, 2016.
physica status solidi (a), 213 (7), pp. 1717-1727, 2016. Technological Innovation for Cyber-Physical Systems, 470 , Springer, Cham, 2016, ISBN: 978-3-319-31165-4. Thin Solid Films , 575 , pp. 72-75, 2015. Progress in Organic Coatings , 80 , pp. 27-32, 2015. Organic Electronics, 22 , pp. 12-19, 2015. Chemical Communications, 51 (53), pp. 10742-10745, 2015. Nano Energy, 16 , pp. 130-142, 2015. Thin Solid Films , 595 , pp. 258-265, 2015. Japanese Journal of Applied Physics , 53 (5S1), pp. 05FM05, 2014. Vacuum, 107 , pp. 145, 2014. Sensors and Actuators A, 195 , pp. 133, 2013. Surface & Coatings Technology , 235 , pp. 361, 2013.